Excavations and further work is undertaken when significant archaeological remains have been demonstrated to exist on a site, and which may be destroyed or affected through the proposed development. These are often the most exciting part of our work! 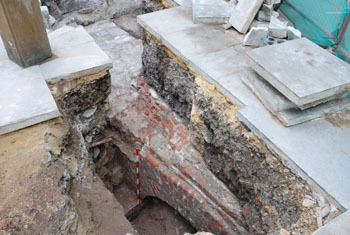 Further work has recently taken place in Bartholomew Lane, just behind the Bank of England, where the remains of a medieval church (St Bartholomew by the Exchange) were uncovered. This was burnt down in the Great Fire, and a 'burnt deposit' was found which could be dated to within a few hours based on when the fire hit this part of the City! 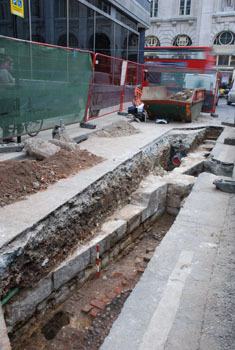 Other exciting finds in the City include part of a late 18th Century East India Company Warehouse in Seething Lane, and parts of the foundations of the boundary wall of Wren's Cathedral at St Paul's. 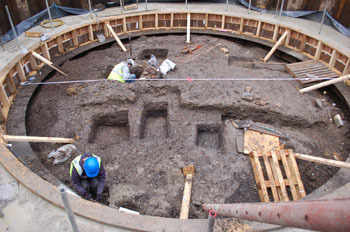 Further work outside of the City includes an investigation in Sevenoaks, Kent, where a Bronze Age burnt mound was uncovered, a medieval cemetry in Chelsfield, Bromley, and 15th - 16th Century deposits at West Ham, uncovered during a flood alleviation scheme. 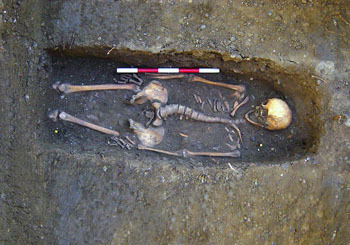 Medieval skeleton from Church in Chelsfield, Bromley. Boundary wall of Wren's Cathedral at St Paul's. St Bartholomew's Church, Bartholomew Lane. Bronze Age burnt mound in Sevenoaks. 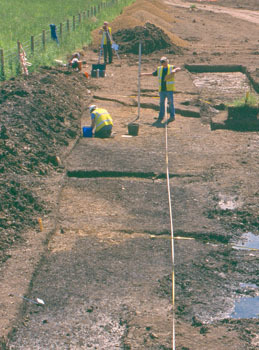 Excavation of 15th - 16th Century deposits at West Ham.